Find out how we can better help your community. Donate Today with our secure online Paypal system. Making a donation to our non-profit is safe, easy, and a few clicks away. A Hooked on Books for Kids volunteer reading to students at Wayne School. Encouraging life-long reading and learning. An annual fundraising event to ensure that all kids in our region have books in their homes. This is a brief glance at some of the local activities that Hooked on Books engages in each year in the Erie Area. Fund raising is through direct mail, newspaper, television, and radio appeals to individuals, companies, and organizations; by newsletter communication with members; by matching funds programs with General Electric; by applying for grants from appropriate agencies. Publicity is through our newsletter, brochures, presentations, flyers and radio and television appearances. We acquire books by purchasing them at substantial discount from First Book in Washington, D.C. and from Scholastic, Inc. Our 2015 average price per book was only 74 cents. Book distribution is primarily out of our storage area at St. John’s Lutheran Church, 2216 Peach St., Erie, PA. to non-profit groups and secondarily through 13 Books for Birthdays outlets. See Books for Birthdays for more information. We encourage reading through the speaker's bureau, publicity efforts, brochures, and the newsletter. To encourage life-long reading and learning among the children and youth of Erie County. To promote in-home reading by parents to their children. To encourage schools to promote in-home reading programs. To make the community aware of the need for books in homes, home reading programs, and life-long learning. Books for Kids works with other non-profit agencies serving the economically disadvantaged to distribute books to children and youth who need them. Books for Birthdays provides outlets where parents or other care-givers may choose up to three books per year for a child's birthday or other occasion. Speaker's Bureau provides representatives of Books for Kids to organizations and groups that want to learn more about literacy and the work of Books for Kids. Hooked on Books for Kids is an all-volunteer, non-profit organization devoted to literacy, the love of reading, and life-long learning among the underprivileged children and youth of Erie County, Pennsylvania. It accomplishes these missions by giving brand-new, high quality books to needy children and youth from birth to age 18, by providing adult reading pals to children at the Neighborhood Art House throughout the year, and by sending adult volunteer readers each month to students in grades K through 4 at Wayne School. Since our founding in 1990, we have distributed over 370,000 books. Hooked on Books for Kids distributes books through schools, social service agencies, food banks, service organizations, and other non-profits that serve underprivileged children and/or youth in Erie County. As an all-volunteer organization, we have very low overhead and no paid staff. All funds raised are used to purchase books or for direct program costs such as printing, postage, and warehouse space. Make a tax deductable donation quickly with PayPal Payments. PayPal securely processes donations for Hooked on Books for Kids. Dozens of non-profit oganizations in Erie County have received books to distribute to needy children, including groups such as the Boys and Girls Clubs of Erie, Inner-city schools, Shriners Hospital, GECAC Learning Center, Edmund Thomas Adolescent Center, Erie Tenant Council, Achievement Center, Florence Crittenton Home, Student Parenting Program, City Center Outreach, Student Medical Association, LECOM, Hispanic American Council, Martin Luther King Center, Perseus Home, Juvenile Probation, twenty-six food pantries, and many more. Our average price per book in 2015 was $0.74 per book. Book distribution is out of our warehouse at St. John’s Lutheran Church, 2216 Peach Street. Over 90% of the funds given to Hooked on Books for Kids is used to buy books. 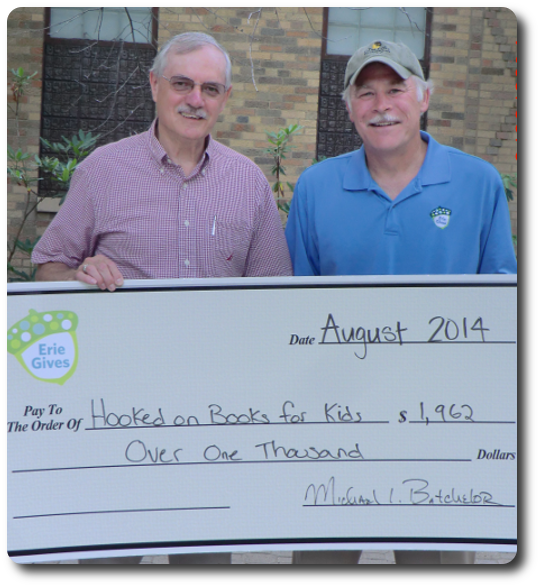 All of the money raised by Books for Kids benefits children and youth in Erie County. Donors to Hooked on Books for Kids receive a quarterly newspaper about our activities and achievements. Hooked on Books for Kids works with other non-profit agencies to distribute books to needy children and youth up to 18 years of age. To obtain books, a non-profit group fills out a simple two-page form and submits it to one of our two distribution persons as listed on the application. Our primary criterion is that at least 50% of the children served by the non-profit applicant group qualify as economically underprivileged by some objective criterion, such as living in subsidized housing or receiving free or subsidized lunches at school. All children served by the agency receive books if 50% or more quality as economically needy. Once an application is approved, the non-profit arranges with our distribution person to meet at our headquarters, St. John’s Lutheran Church, 2216 Peach St., Erie, PA. A map showing the location is on our application form. The applicant non-profit organization then selects from our current inventory appropriate books for the children and/or youth it serves. We ask you to bring your own boxes. Please join in this fun, team-building, and spirited event! All proceeds benefit Hooked on Books for Kids, a non-profit dedicated to literacy, life-long learning, and the love of reading. Since 1990, we have distributed over 450,000 new books to the children and youth of Erie County, birth to age 18. 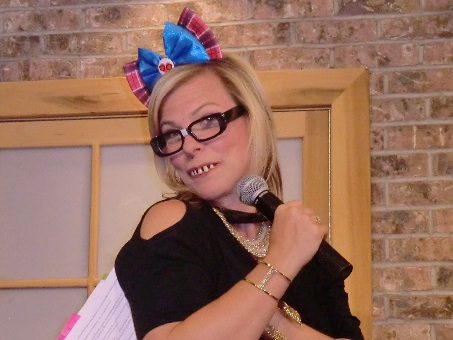 Teams of three adults sponsored by an office, company, or organization collaborate to compete in an old-fashioned style spelling bee. Team prizes are awarded for the bee champion and runner-up, best costumes, and most spirit. We supply practice words to help your team prepare. We would love to have you join us by sponsoring a team and bringing your friends, co-workers, and supporters to cheer on your team. Your support helps us continue our mission, which we achieve by providing new books to underprivileged children and by reading aloud to kids at Edison School, the Neighborhood Art House, and many other locations! Watch the zany fun from 2018! Each month Hooked on Books publishes a newsletter that helps to update and inform our community of supportors on local fund raising activities and events. Please download the lastest news and information about your community Hooked on Books activity. To learn more about our programs and what we can do for your community, please feel free to contact us.